On September 18, 2013, Joe Bowers listed 33 reviews of Diane Ravitch�s new book, Reign of Error: The Hoax of the Privatization Movement and the Danger to America�s Public Schools. 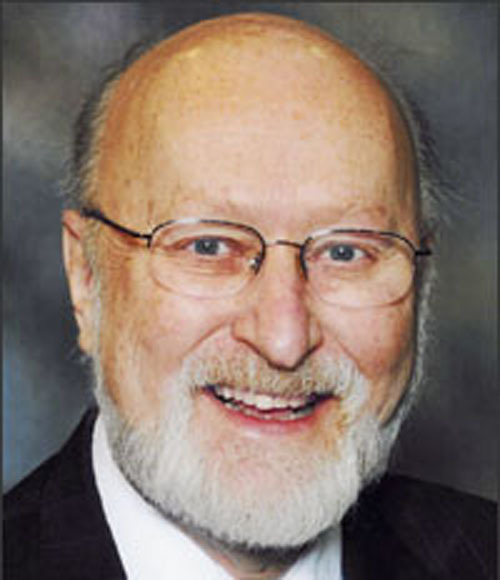 Since then, many other reviews have appeared, including a very substantial one by George Schmidt at Substance News. Please see Joe�s list for some very good play-by-play reviews. That is not what I am offering here. Gerald W. Bracey wrote a dozen books critical of corporate "school reform" prior to his untimely death three years ago. Many of those books foreshadowed Diane Ravitch's "Death and Life of the Great American School System" and "Reign of Error." Prior to his death, Bracey regularly engaged Diane Ravitch in debate about her (then) support for corporate school reform. Bracey's with and wisdom were eventually censored out of publications like the Phi Delta Kappan, which sold out to the Broad Foundation. In 2007 when Diane Ravitch descended from her 20,000-foot view of the education reform landscape to examine what was going on at ground level, she did not like what she saw: children suffering nose-bleeds and vomiting from test anxiety, school personnel and parents humiliated by test results designed to satisfy the failure quotas imposed by cynical and self-serving corporate privateers and political ideologues; educators being blamed for the effects of poverty that no amount of good teaching could fix alone; untrained beginners replacing education professionals in schools that needed the most caring and experienced teachers; schools that had functioned as community centers of identity and activity being closed; a pathological fixation of quantifiable data that had displaced attention to the human needs of growing children; an educational governance structure increasingly controlled by autocratic and arrogant billionaires; and an incredibly shrinking and brittle collection of desiccated facts having replaced the curriculum for the lower caste of segregated untouchable children incarcerated in more and more urban corporate reform schools. 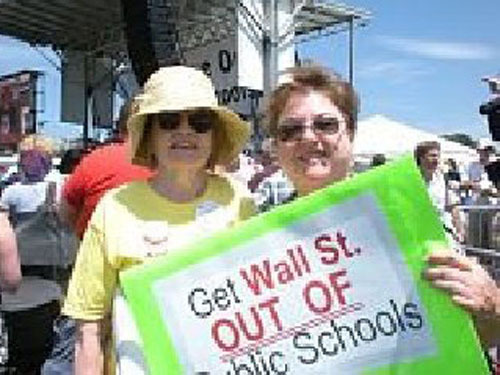 Susan Ohanian (left above during the SOS march and rally in Washington, D.C. in 2010) pioneered much of the critique of corporate school reform during more than 30 years of writing in defense of human schooling in America's public schools. Her website, www.susanohanian.org, is one of the best informed sources for current information about corporate school reform.What makes Diane Ravitch even more unique is that she did not sit behind a screen to offer her insider testimony on these issues to the court of public opinion and then go into an educational witness protection program but, rather, she made the continuing public condemnation of the Billionaire Boys Club her raison d��tre, even as the plutocrats� high-testosterone testocrats have challenged her unassailable facts and as the academic mercenaries from the corporate think tanks have resorted to pretzel logic in attempts to refute her wisdom. Since 2010 when she published Death and Life of the Great American School System, Ravitch has been on a non-stop one-woman road show, crisscrossing the country, speaking to the growing and rumbling army of educators of the nation�s PS Hope. Somehow she has found time between her face-to-face engagements and her online presence as both tweeter and blogger, to write a new book with a cover title in two inch orange Day-Glo letters: "Reign of Error� "
Unlike with Death and Life�, which Ravitch shopped to numerous publishers before landing with Basic Books, this time New York�s premier publishing house, Knopf, was eager to snap up Reign or Error�, along with generous provisions for promotion, advertising, and touring. The new book picks up where the last one left off, this time mixing sharp punctures of the CorpEd gas bags with lists of positive strategies that are sure to rankle the proto-fascist sensibilities of the corporate Borg�s swarm of propagandists, e.g., the Wall Street Journal. 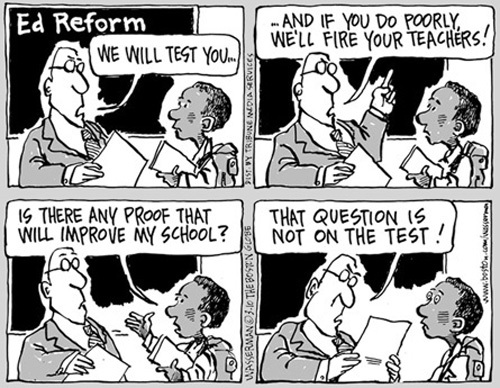 Cartoons have depicted the idiocy of corporation school reform for more than a decade, but the Arne Duncans and Michelle Rhees of the world have no sense of humor about their mission to destroy public schools and teacher unions. In this new volume, in fact, Ravitch has brought a megaphone to the long-ignored message that resistance, indeed, is not futile but, rather, resistance is demanded and that resistance will prevail. Her logic to reaching that conclusion is as simple and clear as her deliberate prose, and the directness of her indignant optimism bespeaks an historian who is enjoying her moment and looking forward to a future that she is determined to make livable and learnable for her grandchildren, and ours. The first half of Reign of Error� takes up for discussion a series of reformist claims that are repeated so often by the post-partisan CorpEd think tanks that they would have to be accurate if repetition were sole criterion for establishing truth. Reformist bromides are refuted with clear statements from evidence-based reality that are accompanied with enough documented examples to send any self-serving edupreneur scrambling back to his corporate teaching manual in hopes of salvaging some semblance of pedagogical respectability. 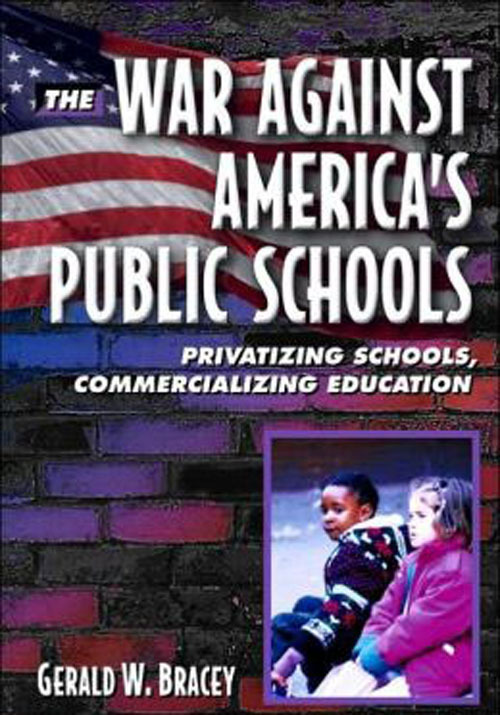 Gerald W. Bracey's "War Against America's Public Schools... privatizing schools, commercializing education" was published ten years before Reign of Error and helped a much smaller audience understand the frauds and fictions behind the attacks on public schools.It took a long time for Dr. Ravitch to break clear of the corporatist influence that has controlled the increasingly-antiquarian version of education reform since the coming of Ronald Reagan in 1980. Whether her conversion in 2007 resulted from the gentle persuasion of researchers like Richard Rothstein or from the fierce prodding of researcher-advocates like Gerald Bracey and Susan Ohanian, Diane has made up for lost time since regaining her sight after being struck blind on the road out of DC. Whatever happens over the next ten or twenty years in education policy, her place is secure, just after six years of battle, as the single individual who most influenced the eventual outcome if parents and teachers and students continue to heed the call for the restoration and renewal of public schools free of high stakes tests for all children who choose a high quality and free education. Ravitch has brought the word�now it is time to act.